Welcome to the Tawas Bay Big Boy. 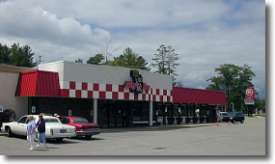 Conveniently located on the U.S. 23 Sunrise Side Heritage Highway in East Tawas, Michigan, the Tawas Bay Big Boy offers the classic Big Boy menu including all of your favorites from the original double-decker Big Boy® Hamburger to the one-of-a-kind Slim Jim™. Whether it's breakfast, lunch, dinner or just dessert, the Tawas Bay Big Boy offers freshly prepared dishes to satisfy your appetite. The Tawas Bay Big Boy also offers free Wi-Fi internet access. The Tawas Bay Big Boy is fully licensed so you may enjoy your favorite alcoholic beverage with your meal.